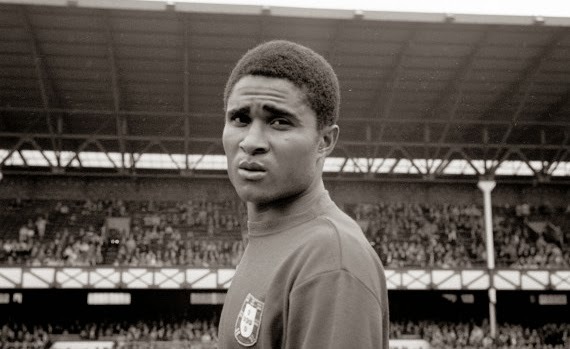 When we think of World Cup heroes, we have to think of Eusebio. A world football legend not only for what he did at his club but also for what he did for his country of Portugal in the 1966 World Cup in England. While I wasn't alive in 1966, that year's World Cup performance of Eusebio will forever be remembered and engraved in the folklore history of Portugal, and remembered by all Portuguese. In the 1966 World Cup, Portugal was placed in Group 3 alongside Bulgaria, Hungary and Brazil. For Eusebio and Portugal this looked like a very difficult group, where they would have to face the heavy favorite Brazil that had a legend of their own in Pele. Eusebio's first game against Hungary was by all standards his weakest performance at the tournament, but Portugal manageded a victory over Bulgaria by the scoreline of 3-1. In the second game of the tournament against Bulgaria, Eusebio would score his first goal of the tournament in a 3-0 victory. He had arrived and from now on this would become his tournament. In the marquee match of the group stage Portugal would face Brazil in a match that would see Eusebio going against another world legend Pele, but Pele was massacred by the Portuguese defensive line and could not finish the match, without him the path to victory was almost a certainty. Portugal defeated Brazil 3-1 and Eusebio scored 2 goals in the match. One of those goals is the now famous volley goal from a very difficult angle following a corner. Portugal went on to finish first in their group with 6 points and Eusebio finished the group stage with 3 goals. In the quarter-finals Portugal would face North Korea, that had defeated and eliminated Italy during the group stages. After going down 3-0 to North Korea in the first 25 minutes, Eusebio went on to score 4 unanswered goals, 2 of them before halftime and the other two at the early stages of the second half. This game in my opinion was the final push that he needed to place his name in World Cup history made him a myth among his people. The way he took control of the team and this game when it seemed obvious that Portugal was going to be eliminated is incredible. Nothing shows that determination in winning and leading his team pass North Korea more than the last of his four goals. He ran and dribbled from his own midfield, passed most of the North Korean team until he was tackled in the penalty area. That play shows not only his determination, but also his quality and ability to dominate a game and be able to dictate what happens on the field. This ability is only at the grasp of selected few. In the semi-finals they would face the hosts England. The game was surrounded in controversy over the place where it should be played. Originally scheduled to be played at Goodison Park in Liverpool, the match was moved to Wembley. The team had to take a last minute train ride from Liverpool to London. The game was very close and Eusebio was not as dominant as he was against North Korea in part due to the man marking of Nobby Stiles. Eusebio was still able to score a goal from the penalty spot in the 82nd minute which ended a 7 game clean sheet streak by the English team. This goal by Eusebio was not enough to defeat England that had scored 2 earlier goals by Bobby Charlton. 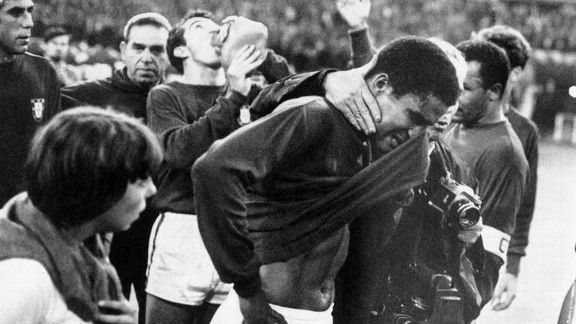 At the end of the match Eusebio walks off the field in tiers surrounded by opponents and team mates. This game is know as "Jogo das Lagrimas" (Game of Tears) in Portugal and the image of him crying as he walked off the field have become a symbol of his love for his country and his desire to win a trophy for his nation. In the third place match against Soviet Union, Eusebio would score his 9th and final goal of the tournament from the penalty spot. After he scored he went to greet Lev Yashin in a true sign of sportsmanship. Portugal went on to win 2-1 and finish 3rd place in the World Cup. That is still the best result ever achieved by Portugal at a World Cup, and the third best by a rookie team. Eusebio's World Cup performance was crown with the golden boot (9 goals in the tournament). This was another great achievement by Eusebio in a tournament where he didn't win the trophy that he wanted but he won the respect and admiration of all of his peers and a sacred place in footballing history.